ARTIST ANDREI TKACHENKO has created his own alternative Soviet automotive history. 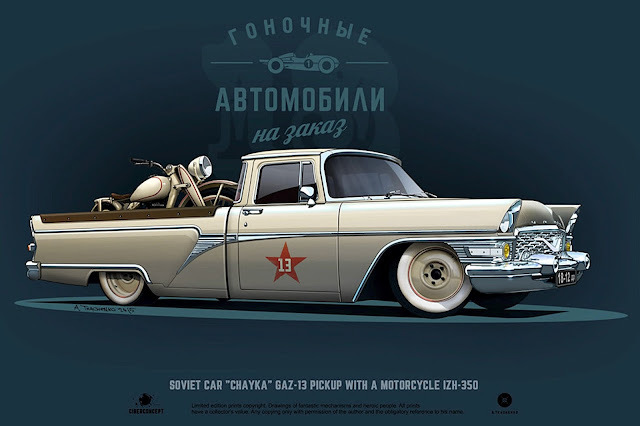 Andrei's handsome artwork reveals a custom style that didn't exist in the real-life Soviet Union. SMN report: During the Cold War years, American customizers were creating amazing machines and wild paint styles. Behind the Iron Curtain, the authorities doubtless frowned on such capitalist activities. So it's now up to Andrei Tkachenko to fill the gap, with a range of original customs that could certainly fill our driveway. Motorcycle and flatbed truck (below) make a fine combo. 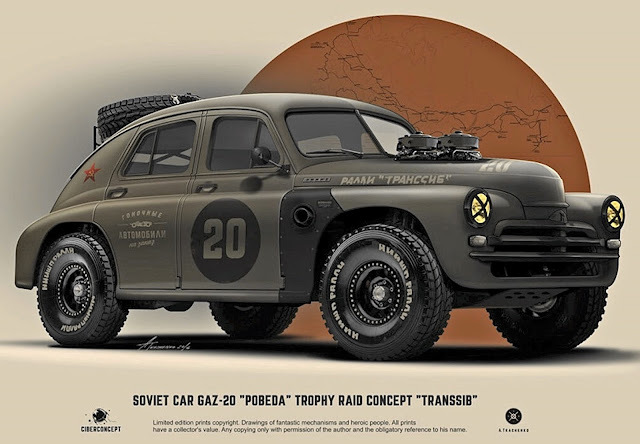 Designwise, the Soviet vehicle looks much like similar light trucks made in the West. 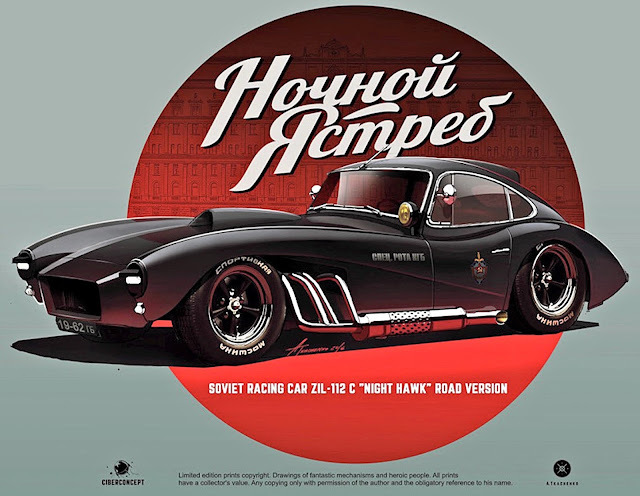 Side-mounted exhaust pipes give the Zil Night Hawk (below) a powerful competition look. In styling terms, the Zil was something of an AC Cobra lookalike, even if the nose intake took its inspiration from the Chevrolet Camaro. The chromed Gaz-13 Chaika (below) was used as official transport by many apparatchiks of the Soviet elite. 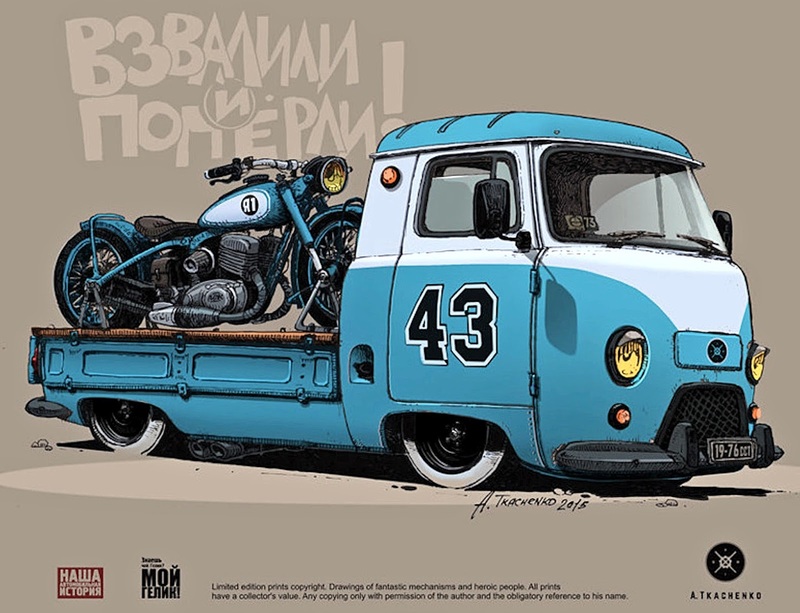 Andrei has chopped the rear to create a pickup, with room for a bike on the load bed. 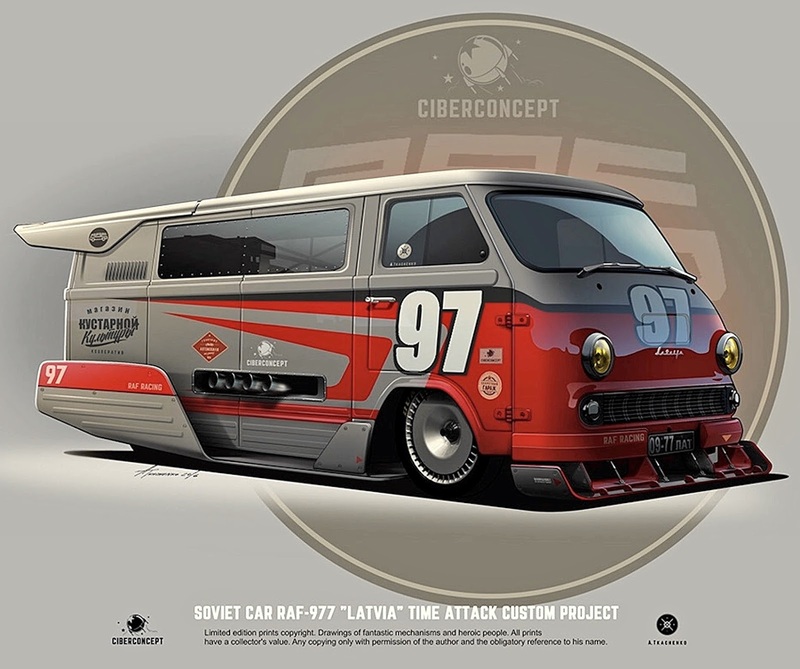 Aero scoops and foils make the RAF-977 race truck (below) look competitive in a Soviet-style drag race. 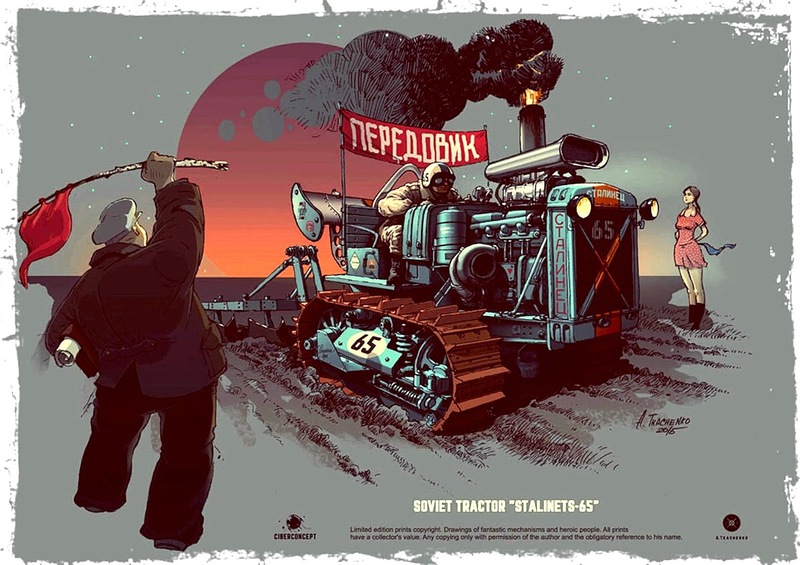 The Soviet Union made tractor production a key item in its various five-year plans. The Tkachenko version of the 11-tonne Stalinets S-65 (below) won't be breaking any speed records, but might make new times for ploughing fields. Simple lines for the panel van (below), modded from a Zil-111 limo. Heavy-duty caterpillar tracks on the Soviet Army vehicle (below) make for a highly unusual looking machine. Andrei's stripes and numbers help the conversion from military to civil use. 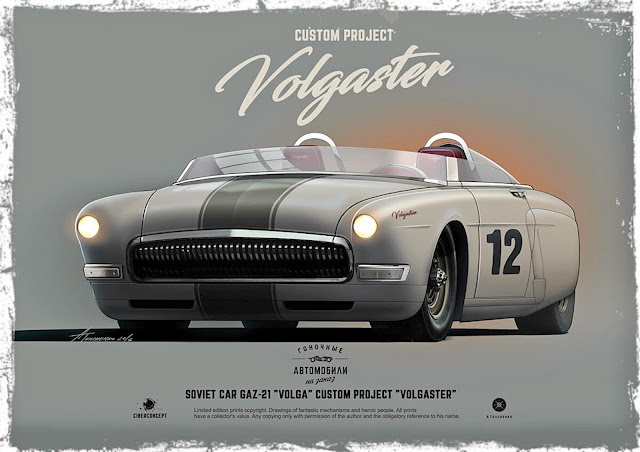 The Gaz-22 Volga (below) looks much like the Volkswagen Variant (Squareback) station wagon of the same time. 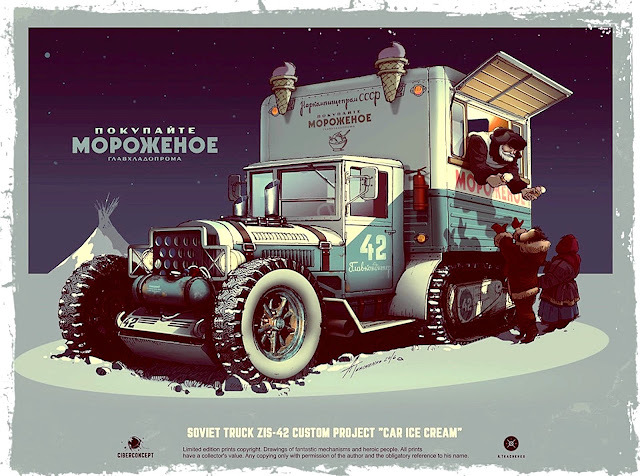 The World War II-era tracked ice cream van (below) is our fave Tkachenko design. We can hear those 'ding-dong' chimes ringing across the snowy Siberian landscape. 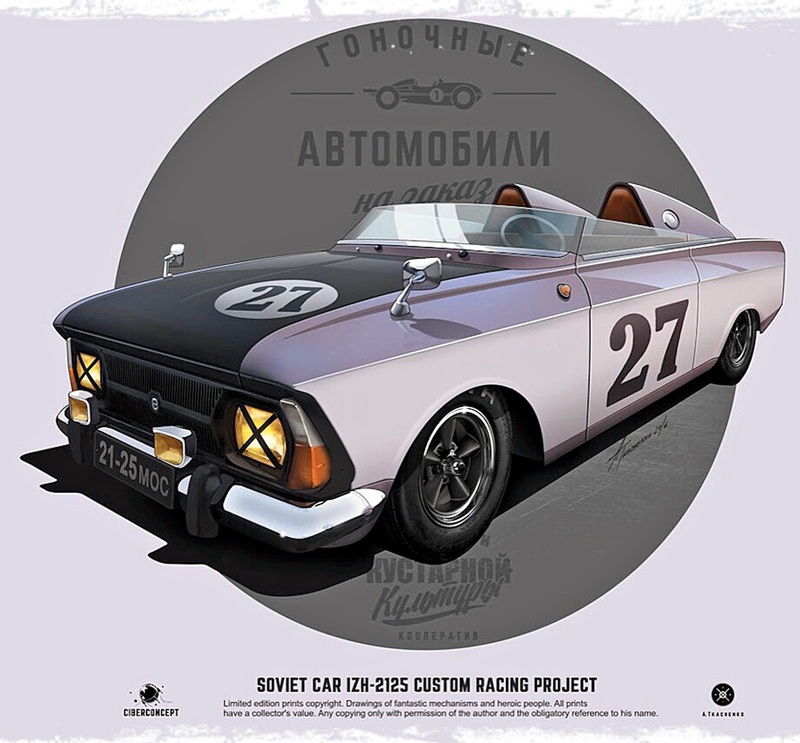 Another two-seater (below) from Andrei, the IZH-2125 custom racing project turns what was a hugely ordinary sedan into a somewhat desirable performance car. 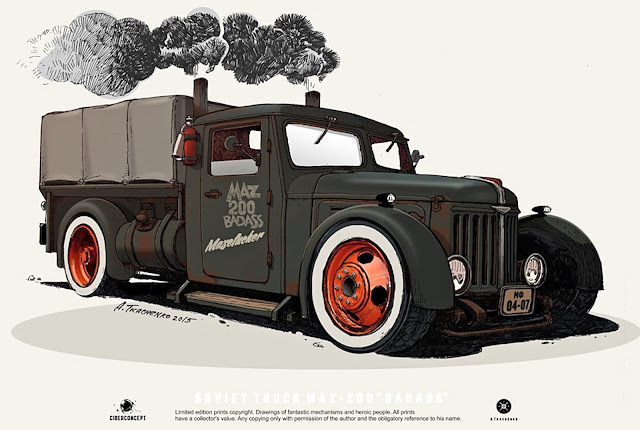 Dirty vehicle exhausts are illegal these days, but the Maz-200 Badass (below) celebrates the giant smoking factories that were a prime political boast for Soviet leaders. Off-road racing calls for the big-tyre look, shown (below). 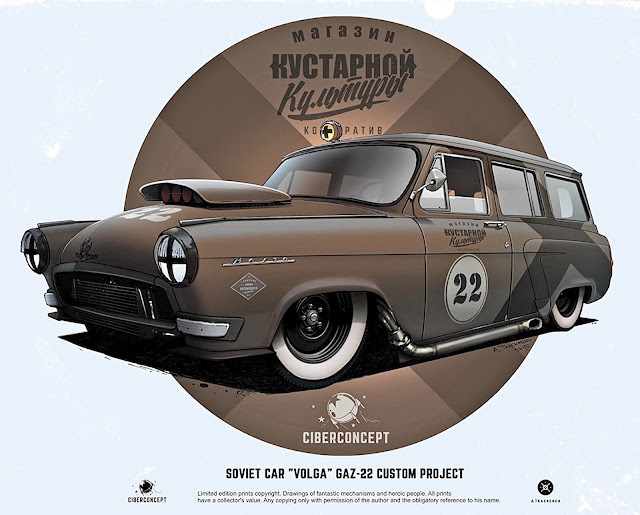 The Gaz-20 has exposed engine intakes, a belly skid plate, and a spare tyre stored over the back window. 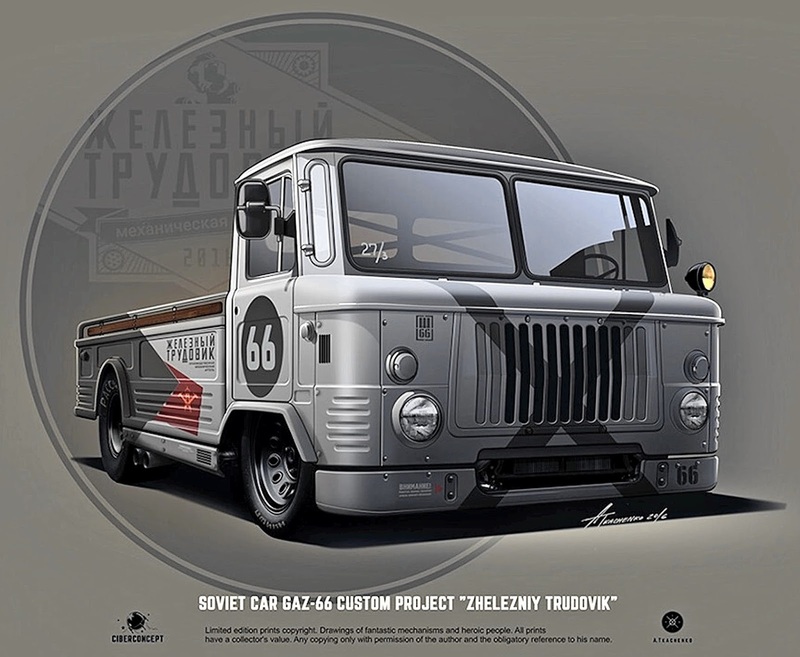 In Andrei's alt-universe, trucks like the Gaz-52 (below) could be modified for racing. 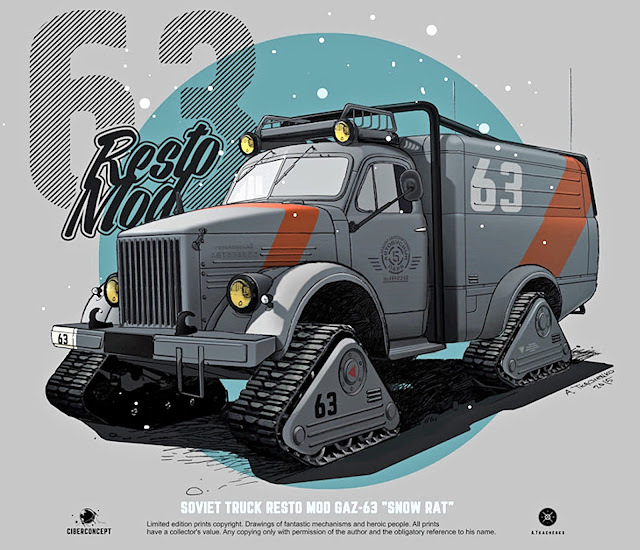 This version could compete in a fictional Siberian Express Rally. Andrei has given the Gaz-21 sedan an open-top Volgaster two-seater look. Note the twin roll bars. Move over Ferrari. 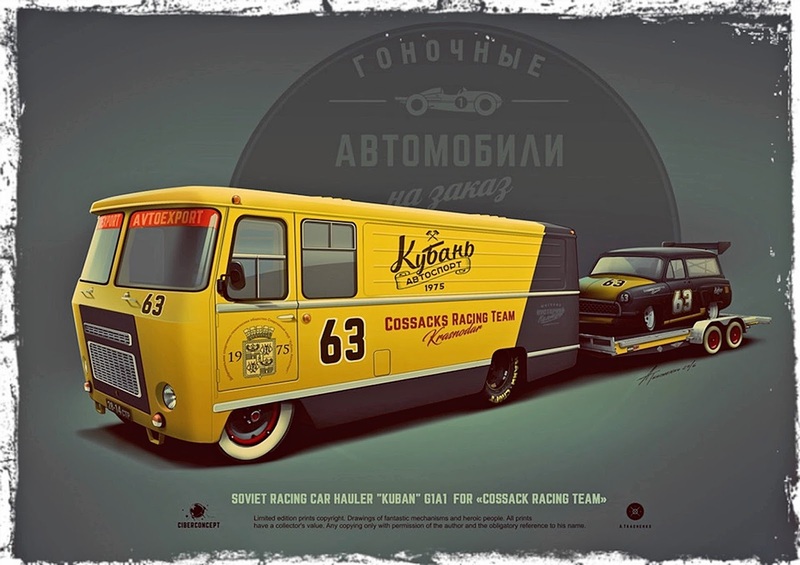 The race car transporter (below) matches the style of even the best looking Western designs. The Gaz-66 commercial van (below) has been given the dropped-body treatment, matched by oversize race tyres and wheels. There aren't too many Soviet-era car kits, but the 1:35 scale Zvezda Gaz M1 (below) could make a good start. 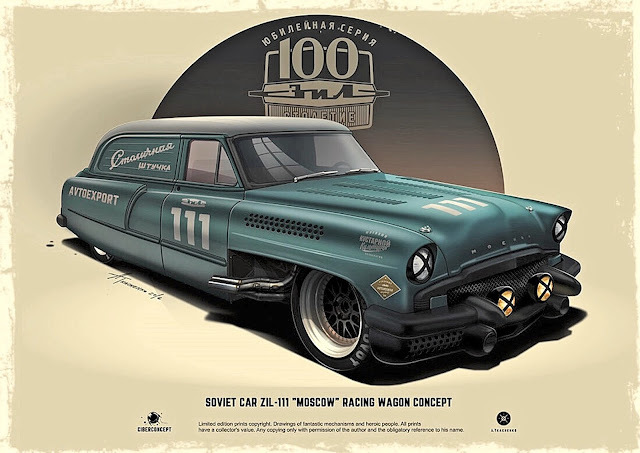 The design may be from an earlier decade, but a Tkachenko-style custom paint treatment could work very well indeed. 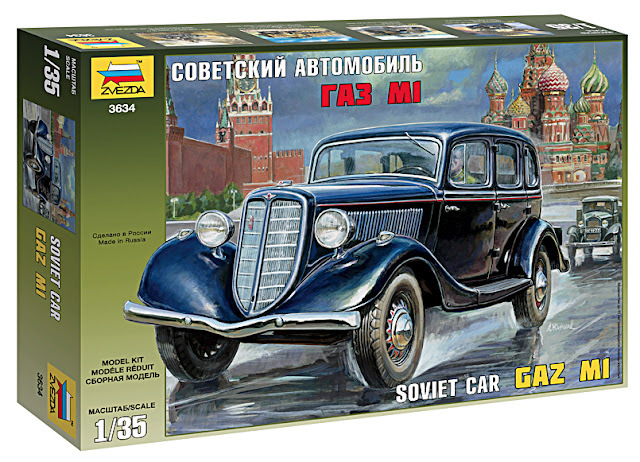 An overall matt-grey paint job, with large red stars applied on sides and roof could be a great new look for the Gaz. Art shown courtesy Andrei Tkachenko. Click here for more.